Happy Tuesday! 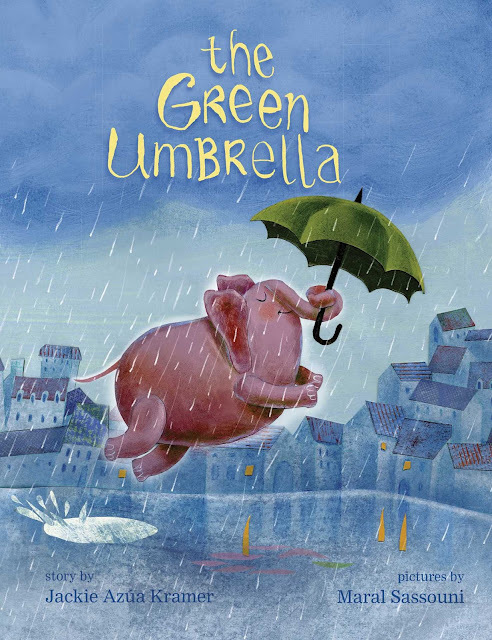 I'm celebrating The Green Umbrella's book trailer, Maral Sassouni's illustrations, reading, and school libraries with Jackie Azúa Kramer. I wrote the words in purple, and she wrote the words in black. Thank you, Jackie! 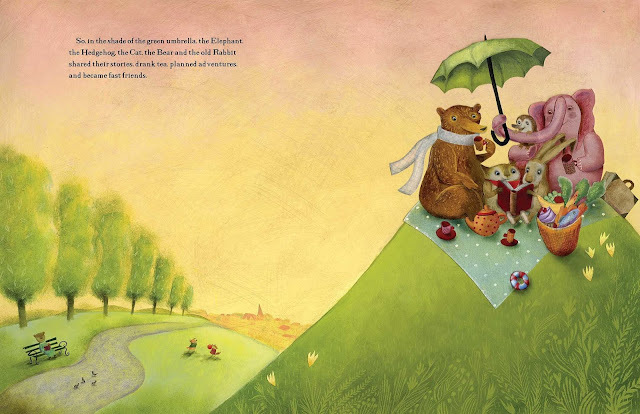 The Green Umbrella’s book trailer makes me envious of my characters. All my imaginings come to life! I want to explore Elephant’s curious little town. I want to jump into Hedgehog’s boat and swim with the dolphins. Touch a star-studded sky with Bear’s flying machine while listening to Debussy’s Clair de lune. 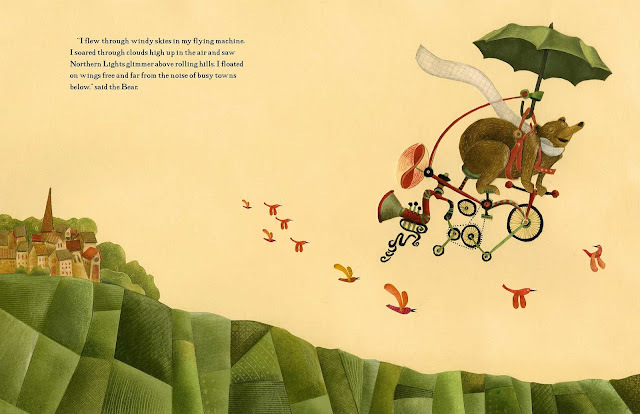 Elephant, Hedgehog, Cat, Bear, and old Rabbit are on their next adventure. Latest I heard, they’re off to 100 Acre Wood. Seems Winnie the Pooh, Tigger, Eeyore, Kanga and the gang, want to see the green umbrella up close. I think Pooh has plans for a honey hunt. Personally, I miss them. I hope they come home soon. They’re the most kind and interesting bunch I’ve ever met. Maral Sassouni’s illustrations are whimsical and enchanting. There’s too much to love! I find myself taking a cozy nap in Cat’s forest after enjoying a cherry-topped cupcake. 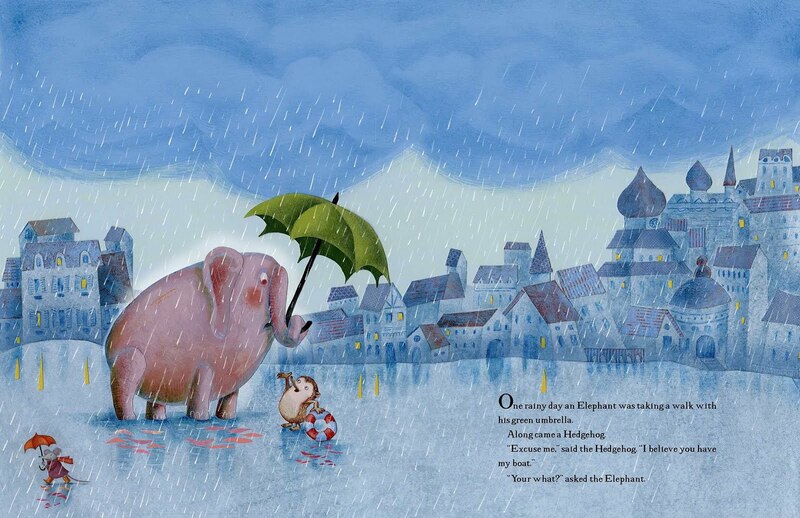 I love the idea that Elephant feels as comfortable wearing a tutu as he is fighting off pirates. And I want all my sunsets to look like lush Italian frescoes. I hope The Green Umbrella is a symbol of freedom. Reading is all the world expressed in a story. Reading is one way to discover ourselves. Reading is a way to discover we aren’t alone. And, like music, dance, art, theatre, film--reading, allows you to feel feelings of sadness, joy, anger, fear, compassion, hilarity, all in a safe space. School libraries make me smile from ear to ear. I feel optimistic knowing that some of our most beloved books and new books will live on in the hands of passionate librarians. 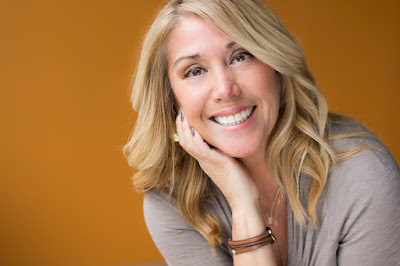 What turns you on creatively, spiritually or emotionally? Passion. What is your favorite curse word? Dang. Ok, I have a few saltier ones. What sound or noise do you love? There are many—wind rustling through leaves, waves, birds singing and reggae music. What sound or noise do you hate? Sharpening of knives. What profession other than your own would you like to attempt? Singer. What profession would you not like to do? With all due respect--doctor. If Heaven exists, what would you like to hear God say when you arrive at the Pearly Gates? Jackie, I’m so glad you’re here! I was starting to get bored! Look for The Green Umbrella on January 31, 2017.